But never mind the tomatoes. This post is about pickles. Three 8 oz jars of pickled beets. I’ve written before that as a child I was not a fan of beets. I didn’t like how their pink juice bled into my mashed potatoes. As an adult, though, I love them. And if I don’t want pink food, I can just put my beets in a dish by themselves. My favorite way to eat them – oven roasted and then tossed in a warm pasta salad with goat cheese and arugula, olive oil and a drizzle of balsamic, and salt and pepper. Yum. My grandfather loved pickled beets. AND he liked to eat them in sandwich form, alongside thick slices of cheddar cheese. Pickled beets were okay…but I didn’t want them in my sandwich. But. Again. Now that I’m an adult…the thought of actually making my own pickled beets is definitely appealing. So the other day Bill and I brought a bowl outside and started harvesting. From above ground, it looked like we had larger beets than we really did. Oh well. That’s what math is for – to adjust recipes! First, though, I had to prep the beets so that I’d know how to adjust the recipe. I left about two inches of stalk on the beet, and left the roots alone. The book (Ball’s Complete Book of Home Canning) recommends doing that to keep the color from bleeding out of the beets. Next, I cleaned the beets, making sure to get all the bits of dirt out of the roots. I put them in a pot and added enough water to cover the beets completely. Then I set the pot on the stove to boil. While that was going on, I cleaned the leaves and sorted them, putting the worst ones in the compost bin and setting the nicest ones aside to use for something else. The book says the beets will take between 20 and 40 minutes to cook, depending on the size, so you have to check each beet with a sharp knife in order to see if they’re tender. When the beets are cooked through, rinse them under cold water (or drop them in an ice bath), and then peel off the outer skin and roots. Trim off the stem and the tap root, and then slice or quarter. The book said to leave the small ones whole, but I sliced those, too. Oh, and the other thing I did (well, I probably did lots of things, but I’m just sharing the relevant stuff) was to chop up a few onions. One of the recipes included onions, and that sounded like a lovely idea to me. Especially since we didn’t have enough beets to make a full (10 cups of sliced beets) recipe. These all came from our garden. Top to bottom, there’s a red onion that never really…onionized. A Cippolini, and a regular white onion. I ended up getting another white onion as well. So. After all the slicing, I ended up with about 2 cups of beets. And after a bit of pencil chewing and counting on my fingers (which did no good, as this problem involved division) I calculated how much I’d need of all the other ingredients. And I washed my canning jars and lids and set them in pots of water to simmer. I also put a large pot of water on the stove for the filled jars. And, in a fourth pot, I combined water, vinegar, sugar, the spices, and the onions. 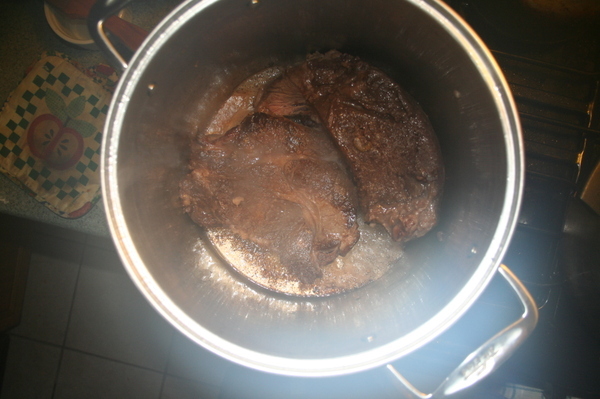 Brought them to a boil, let them simmer a while, and then removed the spice bag. Next, I spooned the beets into the jars (I’d prepped 5 jars but only needed 3), layering them with some of the onions. Then I poured the rest of the liquid from the pot into the jars, leaving 1/2” of head space. I wiped off the jar rims, put the lids and bands on, and placed the jars in the large pot of water. I brought the water to a rolling boil, covered the pot, and boiled the pickles – as directed – for 30 minutes. Then I shut off the heat, removed the pot lid, and let the jars rest for five minutes before taking them out of the liquid. Now, normally I hover over jars like a new mother, waiting for the lids to make that lovely little popping sound as the pressure inside the jars pulls the metal lids tight. But I think Alex and Bill were both talking, and I missed the pops. So I pressed on the lids, in the center, to see if there was any give, which would indicate improper sealing. No give. Good seal. Success. Once the jars had cooled completely, I stuck one in the fridge to chill the beets before we tried them. The onions have absorbed the pink beet color, as you can see. The taste? Very good, though I think I’ll increase the amount of spice for the next batch. Maybe a little more vinegar, too. But overall, pretty tasty. Sweet and tangy, with an earthy but not overpowering hint of beet. I don’t even mind the pink juice. Now I need to make some cheddar, so I can revisit that sandwich, now that I’m all grown up with mature taste buds…. For my tiny-batch recipe, see below. 1. To prepare the beets, cut the stalks so about 2” remain on the beet, and leave the roots intact. Scrub beets clean in cool water. Place beets in a pot, largest on the bottom, smaller beets above, and fill with cold water until the beets are just covered. Bring to a boil and cook anywhere from 20 to 40 minutes. Smaller beets will cook faster than the bigger ones, so at the twenty minute mark, start checking beets by inserting a thin knife into the beet. If the knife goes in easily, the beet is done. Remove beets as they become tender. Rinse in cold water and slip off the outer skin. Trim off root and stalks, and slice about 1/4” thick. Alternately, you could leave the small ones whole and quarter the larger beets. The choice is yours. 3. Make a spice bag for the pickling spices with a small, doubled square of cheesecloth and some string. 4. Place the onions, vinegar, water, sugar, and spice bag in a small pot and bring to a boil. Simmer for about 15 minutes, to infuse liquid with the spices. Discard the bag when done. 5. Spoon sliced beets into jars, layering with some of the onions, leaving a bit more than a 1/2” of head space. Then pour the pickling liquid in to cover the beets and onions, leaving 1/2” of head space per jar. Make sure there are no air pockets by tilting jars or gently inserting a knife into the jar along the side and pressing the vegetables back a bit to allow the liquid to redistribute. Wipe the rims of the jars with damp paper towel, place lids on jars, then bands. Tighten bands to “fingertip tight” (just tight, not so tight that your muscles bulge and your face goes red with effort. 6. Place jars in canning pot, put the lid on the pot and bring to a rolling boil. Starting when the water reaches the rolling boil, process the jars for 30 minutes. Yes, 30. 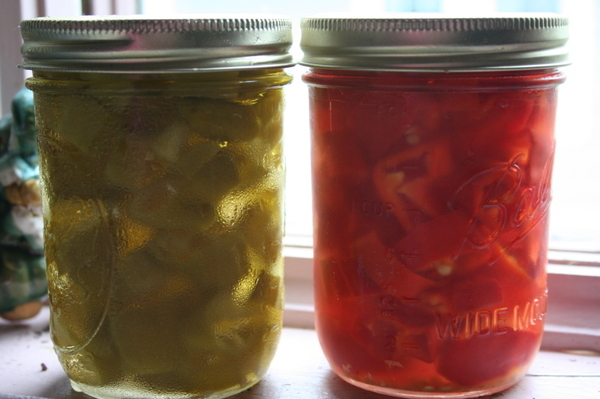 When that’s done, shut off the heat, remove the lid, and leave jars in water for another 5 minutes. Then remove jars, let them cool, and store. You’ll want to listen for the little “pop” sound as the lids complete their seal, but if you don’t hear it, you can check by pressing on the center of the lid with your finger. It should be slightly concave, and there shouldn’t be any give when you press. If the jar hasn’t sealed properly, store in the fridge and consume within a couple weeks. If the jar has sealed properly, label the jars and add them to your pantry.